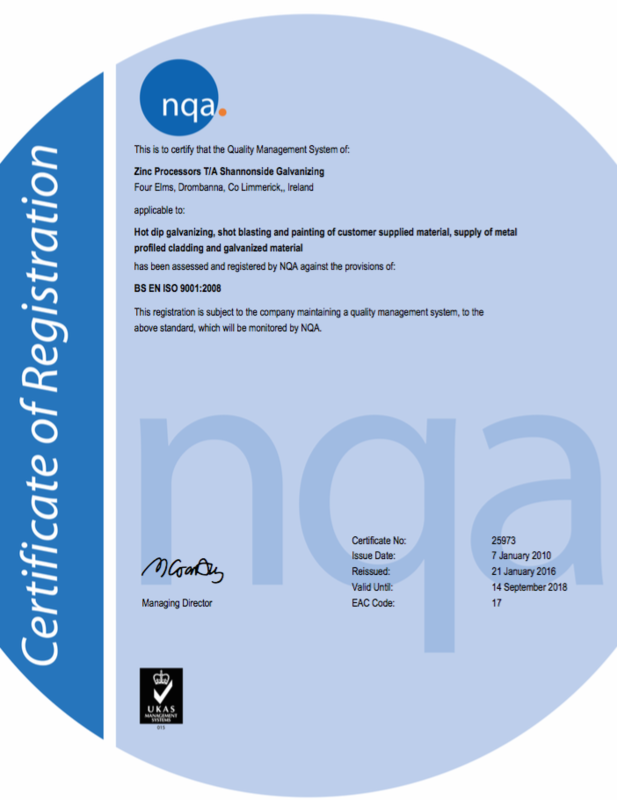 Shannonside Galvanizing holds ISO 9001:2009 accreditation for Hot Dip Galvanizing, Shot Blasting and Painting. Our commitment and motivation to do the very best job sets us apart from others in our industry. Not only that but we employ 2 of the only ICORR Certified Hot Dip Galvanizing Inspectors in Ireland. We have built extensive knowledge and understanding of our customer’s requirements in the galvinizing industry. We continue to deliver a high quality products that ensure our customers return to us time and time again. Whether you shop online in our online store, we offer a fantastic delivery or collection service to any part of the country. Our fleet of trucks coupled with our strategic alliances with transport agencies in Ireland means that we can offer the most efficient collection and delivery service to take the stress out of managing your order.